CUFFLINKS INC 3D Death Star II Stud Set (Silver) | What Should I Say? Cufflinks Inc was formed under a simple idea- there is beauty in tradition. From the office to a wedding or a night out on the town, these classically stylish yet remarkably modern accessories are all the details that a well dressed man needs. 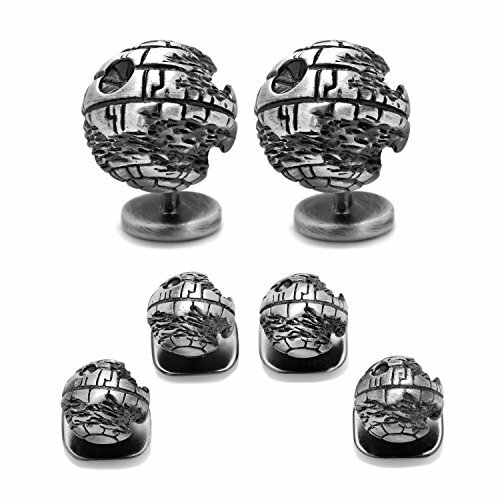 Accentuate your style with this 3D Death Star II Stud Set. Cufflinks are approximately 3/4" x 3/4". CUFFLINKS INC - Designed to appeal to the modern executive, Cufflinks Inc's line of men's accessories are both affordable and stylish. From traditional cufflinks, to tie bars and more, Cufflinks Inc provides all the perfect details for the well dressed man. STYLE - Cufflinks, tie bars and other suit accessories are the perfect way to show off your personality! Available in a wide variety of designs and motifs ranging from sports teams to comic books and classic cars, you'll always be able to find a style that represents the things you love most. FINISHING TOUCH - No matter where you're going, you want to look your best, and it's the little details that finish off an outfit. Cufflinks Inc's line of men's accessories are classically designed, timeless pieces that will add the right amount of detail to any ensemble. GIFT - Give this as the perfect gift for Father?s Day, Anniversaries, Graduates or Groomsmen! DETAILS - Cufflinks are approximately 3/4" x 3/4"